Arguably the most important factor in soft bodied lure fishing (soft plastics and soft baits) is selecting a jig head that best suits the conditions encountered. Much of what has been written on this subject is fairly generic and it often does not make much sense until you’ve experimented extensively and learned from experience what works best and when. Many people just don’t have the free time to do this and as a consequence soon end up giving up on using soft bodied lures because of their lack of success. Jig heads are the easiest and most common way to fish soft bodied lures. They come in a variety of sizes, weights, colours and shapes. 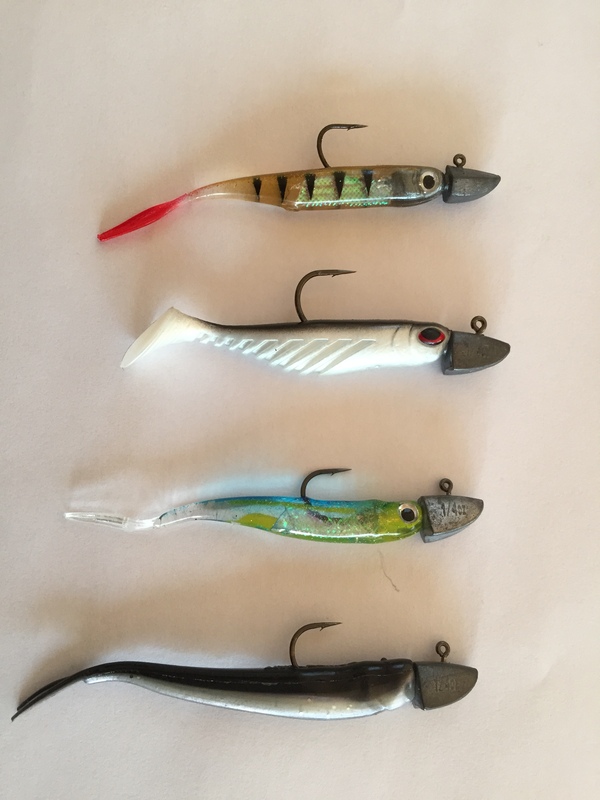 Each shape is designed to be used a different soft bodied lure type but information on which head matches which lure type is often not readily available. 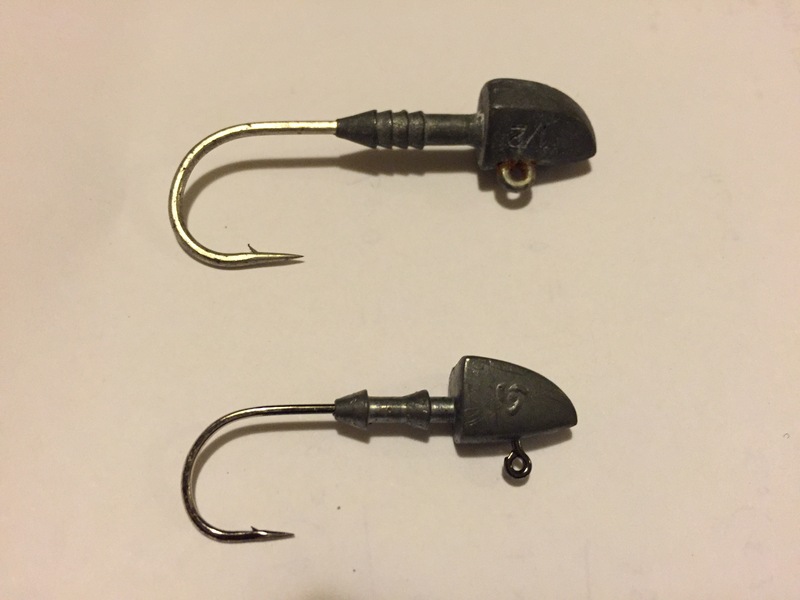 In this article I’m going to look at the anatomy of a jig head focussing on head shape, sink rate and the size and wire gauge of the hooks used. The first thing to recognise is that the head is more than just a sinker to get the soft bodied lure into the strike zone. 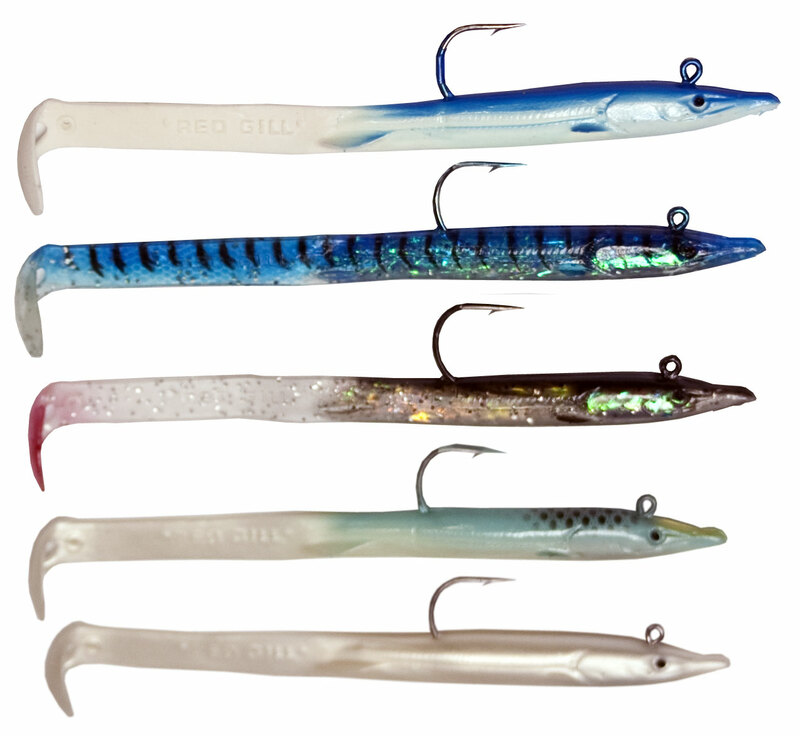 Different shaped heads sink at different rates and some heads impart a unique action to the lure when it is either dropping through the water column, lifted up through it or is simply sitting on the bottom. The head profile may on occasions also need to match the body of the prey that it is imitating so whether it is thin and deep (easily visible from side on) or broad and thin (visible from above and below) can be important. It is probably best to always try to make the lure look as natural as possible. A wobbling action on the up-lift can be achieved with a broad head or one that has a tapered lip in front of the tow point (much the same as the bib on a hard bodied lure). Broad heads are likely to dart on the uplift and glide or flutter on the drop. A deep, very thin head (like a coin standing on end) will rise easily and smoothly on the up-lift and is likely to flicker on the drop. How the lure sits in the water and how the water flows around it will depend on where the line is attached to the head (position of the tow-point). A tow-point over the central balance point of the lure will drag it at right angles to the direction it is facing. Both ends of the lure will rise at the same time. The section of the head in front of the tow-point will, to some extent, act as a wobbling lip and a diving paravane. A tow-point at the front of the head will lift the lure up by the nose, giving it more of a nodding action when lifted and dropped. A forward tow-point will induce the lure to lift and plane upwards at speed. Attaching the line to the head with a loop knot or snap clip will allow the head to pivot freely, which gives it more of a nodding action when the angler lifts and drops the lure. A firm knot attached to the head will give the lure a slightly more undulating flowing action, as the attached leader provides little resistance as it sinks through the water. The sink rate of the jig head is determined largely by its shape. Of all of the shapes available spherical “ball shaped” jig heads sink the fastest. 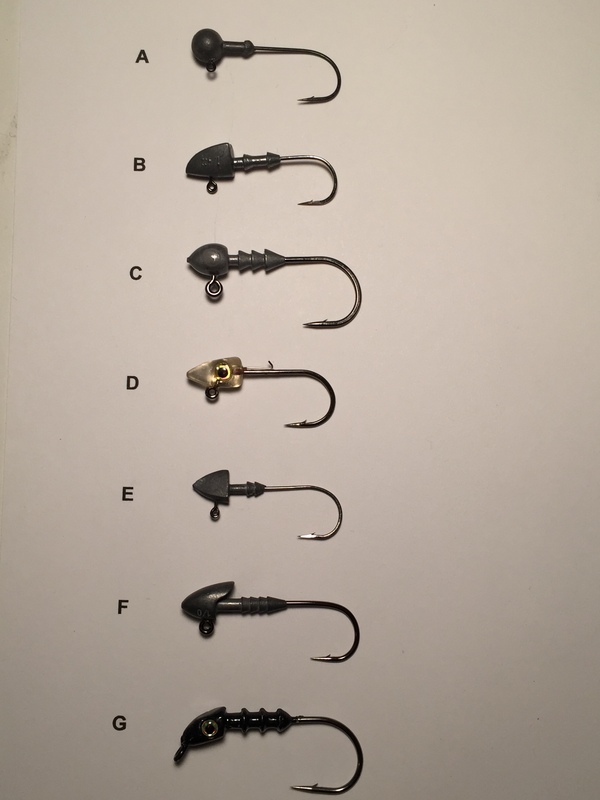 To verify this I recently ran an experiment to measure the sink rates of a variety of different shaped jig heads. This involved dropping each jig head into a glass cylinder filled with glycerine and timing how long it took them to get to the bottom. I repeated the drops multiple times and averaged the time taken to reach the bottom. The jig head shapes tested are shown in the image below and the sink rates in the following table. The most interesting thing that I found was that a 4.67 gram spherical jig head descended to the bottom in the same time as other shaped jig heads that were almost twice the weight (7.00 and 7.88 grams). This clearly shows that if you want to get a soft plastic to the bottom quickly then it makes sense to use a spherical jig head. The flatter the shape becomes the slower it sinks. 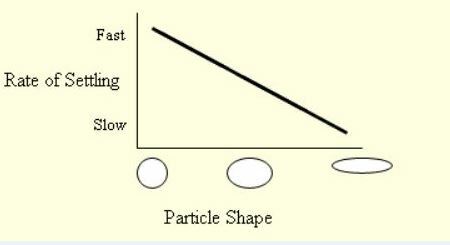 In the table above you will also notice a column headed “Shape Factor”. The shape factor for a spherical jig head is 1. The closer the shape factor for the other types of jig heads is to 1 then the closer its sink time is to that of a spherical jig head. I calculated the shape factors for all of the jig heads tested to make it easy to see how they compared to each other. The results show that jig head C (Ocean Angler Light Bulb) with a shape factor of 0.88 has the second fastest sink rate. If you want to slow down the sink rate then chose a jig head with the smallest shape factor and then adjust the weight to suit the depth being fished. In shallow water with little current it is often preferable for a soft bodied lure to settle slowly through the water column. This can be achieved by switching to a jig head made from resin or a much lighter jig head. By ensuring that the lure slowly percolates down through the water column it is more likely to be spotted by fish holding at any depth. In deep water, particularly where there is current, it may be essential for the jig head to plummet down quickly to the bottom. Selecting a spherical jig head and matching it to a slim tail is a good option. A head that is weighted forward of the tow point will tip the lure downward on the drop and sink with less resistance. If the fish are holding in mid water it may be necessary to adjust the drop speed to ensure that the lure can be intercepted. This is especially true with paddle tailed lures. Soft bodied lures work best from a drifting boat. Fundamental to boat fishing with soft bodied lures is to cast in the direction that the boat is drifting, ahead of the boat, and to work the lure slowly back towards you as the boat drifts down on it. Here the trick is to make sure the sink rate of the lure is marginally faster than the drift rate of the boat so that the lure gets to the bottom well before the boat arrives. 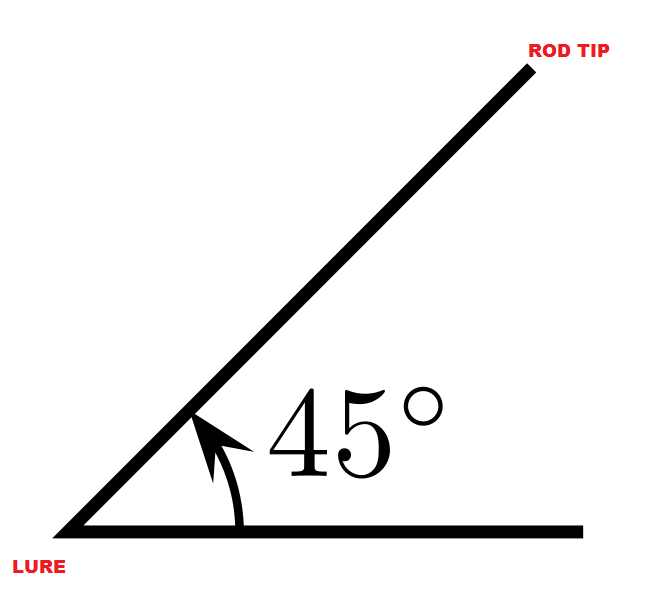 A good place to start is to cast far enough forward to have an angle of 45 degrees from the lure to the rod tip when the lure first hits the bottom. It is possible to catch fish behind the boat by dragging the lure but casting ahead is generally more productive. One thing that jig head manufacturers could do to help anglers is actually print or stamp the sink rates on all jig heads or jig head packaging. This would make it so much easier to select a jig head for a particular situation. While I’m on this theme it would also be helpful if they also provided the wire diameter of the hook. You’ll see why shortly. The next point to consider in selecting a jig head is the size and wire gauge (diameter) of the hook. My preference is always to select the smallest hooks with thinnest gauge wire practicable. The main reason being that it takes less force to set thinner gauge wire hooks. Less force equals better hook up rates. In the image below the wire diameter of the top jig head is roughly 1.7 times greater than the bottom jig head. This means that it will require around 3 times more force to set the top hook to the same depth. It is very hard to do that, even with braid, so hook up rates suffer. Obviously thin hooks are not as strong as heavier gauge wire hooks so there is a trade-off between hook up rates and making sure the hook does not bend during the fight, especially if you are using heavy drag settings to try and stop a fish from gaining sanctuary in foul ground. If you select jig heads that are made using quality hooks from reputable manufacturers, such as Owner, Gamakatsu, Mustad and Eagle Claw, then you are less likely to have performance issues. When fishing in shallow estuaries with minimal foul ground, targeting fish smaller than 2.5 kilograms with lures smaller than 7.5 centimetres, there is comparatively little risk associated with using fine wire hooks. When you hook up on something big it is possible to let it run and wear it down using the rod and a relatively light drag setting. However, if you are targeting big fish in gnarly ground with lots of current then using heavy wire jig heads is a must simply because heavy drag settings are required to stop the fish from reaching cover and breaking off. the hook gape should not be more than 1.5 times greater than the depth of the soft plastic being threaded on. when the soft plastic is threaded on the hook gape should not sit further back than halfway along the length of the tail else it will restrict the movement of the tail (see below). The final point that I want to make about jig heads is the collar that the soft plastic is threaded over to keep it on the hook. Many collars are too large for small lures and split the bodies which affects how well the soft bodied lure tracks when retrieved. This is a failing with many of the common brands available in the market. Bear this in mind when selecting jig heads. Great article Alan well thought out. I’d also like to point out that to cast 3 – 10 gm lures any distance when casting still, or slow moving waters, you really need a 1-3kg line class rod and light braid to get the best out of your soft-plastic jig-head combination. I read articles that say us 1/8 oz, 1/16/oz, 1/32oz. My question is i have a box full of jigs how do i tell the weight of a jig by measuring the jig head? The only way to work out the weight definitively is to weigh them. Are they all round jig heads or various shapes? Are they all made of lead? If they are round then I can help. Where can I find a mold to make hull shaped jig heads? Hi Roger, I’d try Bass Pro or Cabela’s in the USA. Cheers, Alan. This is a brilliant article! I edit a newsletter for the Christchurch fishing and casting club and was wondering if you would allow me to use this article in my next issue. It would be great reading for newcomers and old pros alike. I will give due credit and if there are specific links and credits you would like me to use le me know.